Nestled among the towering Ponderosa Pines, the Kelowna Golf & Country Club is known for its arresting beauty and consistently fine grooming –making it a 'must play' for all golfers. This semi-private club is located in the heart of the city. 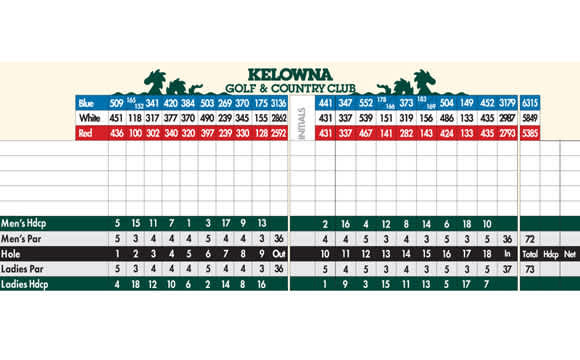 No golf experience is complete without a visit to Kelowna's favorite course. Pro Insights Description: This hole marks the beginning of the famous "Amen Corner" where tournaments are often won or lost. Making the green in two may require divine intervention. This hole marks the beginning of the famous "Amen Corner" where tournaments are often won or lost. Making the green in two may require divine intervention.